Gartner, the largest technology market research firm, presented a scenario for 100,000 electric car sales in 2012 in the United States. Yesterday, I took in the presentation at the SV Forum and then talked with Thilo Koslowski, Vice President of Gartner’s Automotive and Vehicle Practice. He acknowledged that 100,000 is quite a jump from the 18,000 sold in 2011 which included 9,674 Nissan LEAFs, 7,671 Chevrolet Volts, and 655 other plug-in cars. In 2011, Japan’s earthquake, tsunami, and nuclear meltdown affected everyone’s supply chain. The recession left most cautious about spending $30,000, $40,000, or more for unproven vehicles. Although some 280,000-gasoline cars catch fire in the U.S. annually, fires in some Volt test crashes lead to safety concerns. It was only mid-year that the Nissan LEAF received the top five-star safety rating from NHTSA. 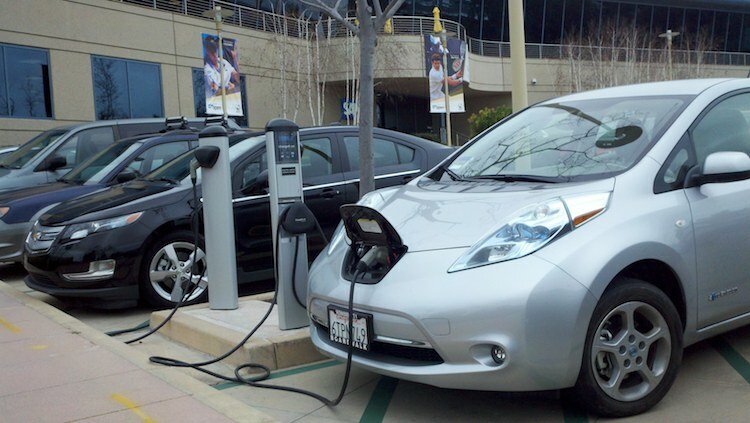 Clean Fleet Report considers 100,000 to be a good forecast for U.S. EV sales in 2012. Nissan is manufacturing 50,000 LEAFs this year, then greatly expanding production next year with a new Tennessee plant. The Renault-Nissan Alliance is betting billions on electric vehicles and lithium batteries. GM has expanded manufacturing for global sales of 65,000 electric cars. At the SV Forum, Byron Shaw, who manages the Advanced Technology Office for GM in Silicon Valley, discussed GM sales of two plug-in hybrids in 2012 – the Chevrolet Volt, which he drives and the Opel Ampera in Europe and GM 2012 sales of a pure battery-electric Chevrolet Spark.. The new Cadillac ELR plug-in hybrid has also been on display at auto shows. Electric city cars will also fuel sales in 2012. The Mitsubishi I has a starting price of only $29,120 – $6,000 less than the LEAF. Toyota will enter the electric city car competition with the Scion IQ Electric. The Honda Fit Electric is no for sale. Car rental and car sharing providers are adding over 1,000 electric cars to their fleet. Car2Go already has 300 Smart Electric Drive Cars on the streets of San Diego in daily use. Ford’s customer choice strategy will also attract more mainstream car buyers. The new Ford Fusion is available as an efficient EcoBoost engine or as a hybrid with better mileage than any midsized sedan or as a plug-in hybrid that allows many trips to use zero gasoline. The Ford Focus is also available as a pure battery-electric. The new crossover SUV Ford C-MAX is also available as a plug-in hybrid. Toyota knows how to sell millions of hybrids. The new Prius Plug-in Hybrid looks and drives just like the best selling Prius. The new Toyota RAV4 EV is a pure battery-electric that looks like the popular RAV4 SUV. In 2012 and 2013, Toyota leverage its hybrid brand into plug-in cars. One hundred thousand electric car sales in 2012 is less than one percent of the 13.4 million U.S. vehicle sales forecasted by Gartner. It is difficult to forecast which will have greater sales, pure battery electric or plug-in hybrid. With early enthusiasts, the battery-electric LEAF is the winner. The SV Forum was hosted at SAP that has 16 charge points and at least 20 employees EV drivers at its Silicon Valley office. LEAFs outnumbered Volts in visitor parking for the forum. The typical U.S. household has two cars. My wife and I share a Nissan LEAF and a hybrid. In 8 months, range has never been an issue. If one of us is driving over 60 miles we take the hybrid. As we progress from early enthusiasts to early adopters, however, the plug-in hybrid may win by eliminating range anxiety. Most compacts and city cars may be electric; most larger cars, crossovers, and SUVs may be plug-in hybrid. By the end of the decade, according to several at the conference, the fuel cell may prove to be the better way to extend the range of an electric vehicle. They see the most fuel cell vehicle progress in Japan and Germany. GM, Toyota, Honda, Mercedes and others continue fuel cell vehicle development. Hyundai is building 2,000 Tuscon ix FCEV. According to a new report from Pike Research, around 410,000 PEVs will be sold between 2011 and 2015 in the United States, and cumulative U.S. sales will not reach the 1 million mark until 2018. Nevertheless, PEV sales are expected to ramp up strongly in the second half of this decade. Global PEV sales are expected to surpass 1 million vehicles per year in 2017 and, by 2020, worldwide sales volumes will reach 1.7 million units annually forecasts Pike. Manufactures will certainly have the capacity to build a million electric cars by 2015. Renault-Nissan and GM are investing billions in plants in the U.S., Europe and Asia. Battery giants like LG Chem, Panasonic, and Samsung are also investing billions. The real question is will U.S. buyers have purchased or leased a million battery-electric and plug-in hybrids by the end of 2015. Gartner’s Koslowski sees two big challenges. First, can the automakers create brands and marketing campaigns that make these vehicles compelling buys. Second, can automakers and battery giants continue to drive down the cost of lithium batteries or storage alternatives? Most buyers will not pay a premium for a hybrid or electric. Then again, millions each year buy premium cars, SUVs and trucks. When drivers want a vehicle, millions convince themselves that one over $30K is right for them. Thilo Koslowski sees 5 to 8 percent of all vehicles being battery-powered by 2020 and 20 to 30 percent by 2030. Urban markets are most promising, but many city dwellers do not have access to garages for charging. The political and media influence of oil giants could slow adoption in some countries. High oil prices could speed adoption. Since Europe and Asia have less appetite to subsidize gasoline prices, they could soon be bigger markets for EVs. By the end of the decade, millions of electric cars are likely to be on the road. Exciting customer experiences, falling cost of ownership, and the price of alternatives will determine how many millions. Ralph; can you post your numbers? I am not sure I would up with free after 12 years ROI. What size and cost of PV are you assuming? Price for car? Same song and dance from me. As these companies utilize solar PV chargeable quick change batteries the sales will increase dramatically. Every auto manufacturing company should have a solar charging (canopy or rooftop) installation division. Blend the cost of the mass produced units together and show that the cost for both is basically free after a 12 year ROI. Set up manufacturing for worldwide distribution. Base the factories in desert climates (Nevada/Arizona, so the same PV energy that powers the robotics, can power the rest of the plant.